AC Emergency Power. 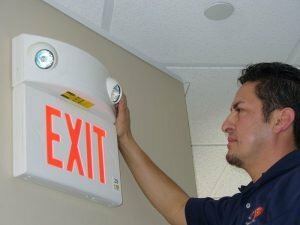 By using central lighting inverters to power existing indoor and outdoor luminaires in lieu of self-contained emergency lights, occupants are more likely to evacuate to a public way in a safe and orderly fashion. In an emergency, life safety is the number one priority. 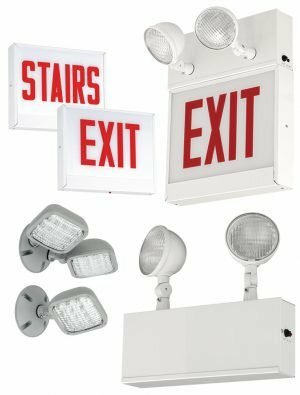 By using central lighting inverters to power existing indoor and outdoor luminaires in lieu of self-contained emergency lights, occupants are more likely to evacuate to a public way in a safe and orderly fashion. Central lighting inverters not only make occupants feel more at ease during a crisis, but they also maintain the architectural integrity of the building and typically yield the lowest total cost of ownership during normal operation. Greater value – increased safety! Safer than other emergency lighting solutions because they typically provide full lumen output of the luminaire resulting in higher emergency light levels. Are more reliable because they are centrally located for easy maintenance and have the capability to email test results or alarm conditions to maintenance personnel . Offer greater value by using existing light sources, which maintains architectural design. Dual-Lite’s central lighting inverter product line offers both interruptible and non-interruptible emergency AC power systems in single- and three-phase configurations. Occupants feel more at ease and are less likely to panic when emergency lighting is provided by existing luminaires. Central lighting inverters power designated luminaires to full lumen output during a power outage ensuring a bright, evenly illuminated path of egress in emergency situations. Using existing luminaires allows occupants to enjoy the original architectural intent and integrity while simultaneously satisfying life safety requirements. In most installations a single central lighting inverter will provide code required power to the emergency lighting vs multiple fluorescent battery packs or unit equipment. This reduces the amount of time and labor required for initial installation. With a centrally located inverter system there is only one location for maintenance vs unit equipment which is located throughout the building, reducing maintenance time and labor costs. Luminaires using HID lamp technology are often selected for a given lighting system because of their energy efficiency, long life and tolerance to high or low ambient temperatures. However, HID lamps are susceptible to voltage drops and have long re-strike times that could exceed life safety code requirements. Where HID luminaires are in use or being considered, an uninterruptible central lighting inverter is the ideal choice as an emergency AC power supply, even when an engine generator set is installed by code requirement. An uninterruptible power supply ensures voltage sensitive loads, such as HID lamps, will operate normally as power transitions from utility power to emergency battery power to emergency generator power and back to normal utility power. In the absence of lighting due to an interruption in the normal power supply, the Life Safety Code calls for illumination of an egress pathway to safely guide building occupants to a “public way.” Some Authorities Having Jurisdiction (AHJs) will interpret a “public way” to include luminaires in outdoor applications. Inverters can remain located inside the building so cold or wet conditions that can impact performance, cost or life of the product are eliminated. The ability to generate the required level of illumination in large venues, such as stadiums or gymnasiums, is beyond the capability of most emergency lighting unit equipment. A properly sized central lighting inverter powering existing fixtures at full light output is the logical choice for these applications. Dual-Lite realizes the initial price of an emergency lighting system is only one consideration when evaluating the total cost of ownership when comparing a centralized vs a decentralized emergency lighting system. Energy costs to operate the unit and annual maintenance expenses can significantly add to the total cost of ownership. Incorporating a central lighting inverter into your emergency lighting system will typically reduce your operating and maintenance costs to yield the lowest overall total cost of ownership. By incorporating energy efficient designs and intuitive interfaces with the latest in remote communications technology, Dual-Lite central lighting inverters are designed to lower the total cost of ownership even further. Available with 100VA or 250VA capacity, Dual-Lite’s LiteGear® compact central lighting inverters provide emergency AC power to existing indoor and outdoor lighting fixtures. The LiteGear® series is compatible with incandescent, compact fluorescent, linear fluorescent and LED lamped fixtures. AC LOCKOUT – Prevents battery damage by shutting off DC battery power prior to AC power being supplied during installation. BROWNOUT PROTECTION – Protects loads from low AC line voltage by automatically transferring the inverter to emergency mode to provide full output power. LOW VOLTAGE DISCONNECT – Protects the batteries from damaging ‘deep-discharge’ conditions during prolonged power outages. MULTIPLE MOUNTING OPTIONS – The compact size of LiteGear® inverters allows the LG2 to be surface wall mounted while the LG1 may be surface wall, recessed wall, or recessed into a T-Grid ceiling. 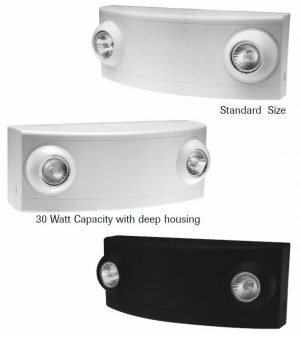 LED LAMP COMPATIBILITY – LiteGear® inverters are typically more cost effective than decentralized battery packs at providing emergency power to a luminaire, especially luminaires using today’s LED lamp technology. 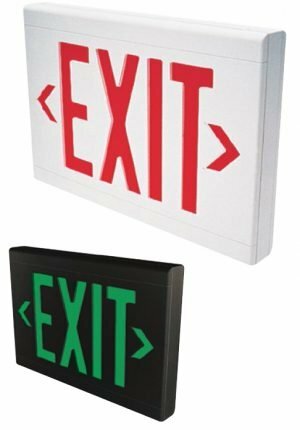 GENERATION I STATUS & CONTROL INTERFACE – Two multipurpose LED indicators provide a simple, intuitive interface to notify the user of operating status. 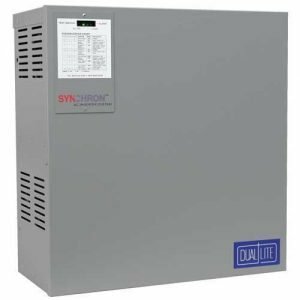 The Synchron single-phase inverter series provides true sine wave emergency power in ratings from 400 to 2100VA/Watts. Featuring true ‘no-break’ switching between utility and inverter power, all connected equipment will continue to operate normally under emergency conditions. The system mounts indoors and powers indoor or outdoor fixtures and other critical loads. OFFLINE TECHNOLOGY – Continuously monitors input power conditions allowing the unit to operate with 98% efficiency translating to lower operating costs. HID COMPATIBILITY – An instantaneous and synchronized transfer of power from normal to emergency mode ensures compatibility with HID lamp sources. TRUE SINE WAVE OUTPUT – Sinusoidal waveforms yield less distortion and assure that voltage sensitive or frequency sensitive loads will operate normally during operation. PULSE WIDTH MODULATION – High frequency digitally generated output waveform that results in greater efficiency, less heat, quieter operation and lower operating costs all within a compact design. SMALL FOOTPRINT – The Synchron inverter system has one of the smallest footprints in the industry – less than 3 square feet! The small cabinet may be wall mounted. GENERATION II STATUS & CONTROL INTERFACE – Three multipurpose LED indicators provide a simple, intuitive interface to notify the user of operating status as well as visual service alerts to operational malfunctions should they occur. This feature rich single-phase system includes self-test/ self-diagnostic circuitry that complies with Life Safety Code testing and recording requirements, a two-line 40 character digital display and a user interface providing control of over 250 operating parameters. 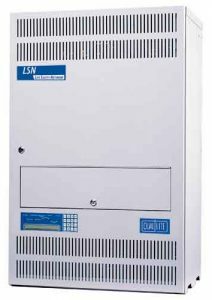 Dual-Lite’s LSN D Series is available in capacity ratings of 1.0 through 17.5 KVA/KW. REMOTE COMMUNICATIONS – All spectron LSN inverter systems are equipped with an RS232 communication interface designed to give the user greater flexibility in monitoring and controlling the system. Optional email capability sends pre-defined users alarm and test reports. ADVANCED BROWNOUT PROTECTION – Dual-Lite’s LSN boost tap regulation protects your loads from brownouts and recurrent low-voltage transients by sensing any drop in voltage and boosting the voltage back up to nominal without drawing current from the batteries and shortening their lives. SMALL FOOTPRINT – Dual-Lite’s LSN inverter system has one of the smallest footprints in the industry – less than 4 square feet for systems less than 5.0KVA! SECURITY – To ensure that only authorized personnel can access the control functions or change any operating parameters, every LSN inverter comes standard with locked cabinetry and password protection. SELF-TESTING/SELF-DIAGNOSTICS – Electronics perform continuous testing of subsystems and lighting loads, ensuring performance to prescribed operating parameters. AUTOMATIC & PROGRAMMABLE RECORDING – User-programmable discharge tests are performed and logged into memory for automatic NFPA 101 compliance. GENERATION III STATUS & CONTROL INTERFACE – A 2-line x 40 character, microprocessor-controlled display located on the inverter cabinet’s front door allows the user to monitor and control the inverter through the use of a menu-driven user interface. 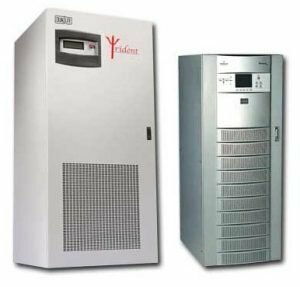 For larger installations, the Trident three-phase series is available in two sizes: the TRX has a capacity rating from 10 to 30KVA and the TRN has a capacity rating from 30 to 130 KVA. Trident’s double-conversion design provides clean, regulated computer grade power in both normal and emergency operating mode. The Trident series offers the smallest three-phase system footprint currently available. The system mounts indoors and powers indoor or outdoor luminaires and other critical loads. DOUBLE CONVERSION TECHNOLOGY – This online technology provides an electronic firewall that allows consistent and steady delivery of clean, filtered power to your critical loads. ADVANCED REMOTE COMMUNICATIONS -Trident inverters are available with a variety of remote monitoring and communications options to report audible and visual signaling of status and alarm conditions using multiple protocols through Ethernet and/or web management tools. GENERATION IV STATUS & CONTROL INTERFACE – The Trident series features a large, user-friendly, LCD graphic display for easy monitoring of operating parameters. Digital controls allow precise and custom programmable inputs to maximize operating efficiency and communications operations.